So, my friend lent me this book and insisted that I read it because the book was, well, I’m not sure. Maybe I borrowed it because everyone I know has now read it and I clearly felt out of the loop. Well, this book is making me depressed. I will begin this post by warning you; I like books where things work out well. Books where people get together, have successful lives and happy families and long, long love stories. In other words I tend to avoid books about reality and general unhappiness. This is not to say that I never read anything uncomfortable or unnerving, it’s just that I tend to like things to work out well. And this book is just not working out well. Things are not going well for the characters and its so damn frustrating when people don’t do what you want them to do! It’s like Wuthering damn Heights! (Which I secretly adore and read regularly but moving along.) In fact I have been forced to make chocolate chip cookies to cheer me up. I know. Chocolate chip cookies do not really need an excuse like a terribly life disturbing book but well, I certainly need them now. 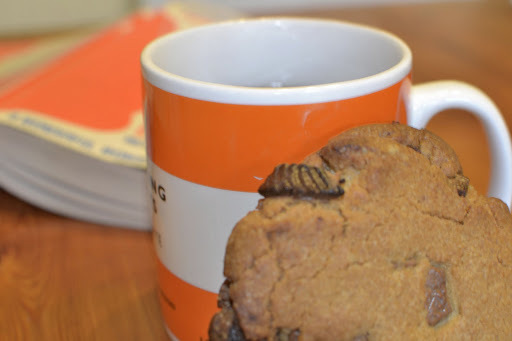 These cookies are from Nigella’s new book, Kitchen. I like Nigella a lot but I tend to use her for reference points rather than recipes. I’ve had bad experiences in the past of things not working out well. These cookies are an exception. As is her chocolate Guinness cake. (More on that another time.) These are American cookies, crispy on the outsides, chewy in the middle and so loaded with chocolate that it is hard to form them well. They are also an American size, that is to say, gigantic. And they take all of five minutes to make and thus make a good addition to the collection if you’re ever in a giant rush for a cookie fix. Basically you melt the butter, allow it to cool and then mix all the ingredients together. Well, almost – see the instructions below. You don’t need a fancy mixer for this though, just a bowl and a wooden spoon. You can use dark, milk or white chocolate chips or a combination of all three, whatever takes your fancy at the time. I happen to have a mound of Easter eggs left over so I used those. (This wasn’t entirely wise because the Easter chocolate is of so poor a quality that I ended up with quite a few burnt chocolate edges – I’ve managed to get past that by eating around the burnt bits, obviously.) It hasn’t entirely dented my stock pile but it’s made a good improvement on a situation that was turning slightly awkward. Nigella also suggests that you use a 60ml measuring cup to form the individual cookies in and then knock out onto the baking tray. This works quite well and allows for even shape and cooking time. These make the perfect 4pm booster or lunchbox treat or any day, anytime eating thing. 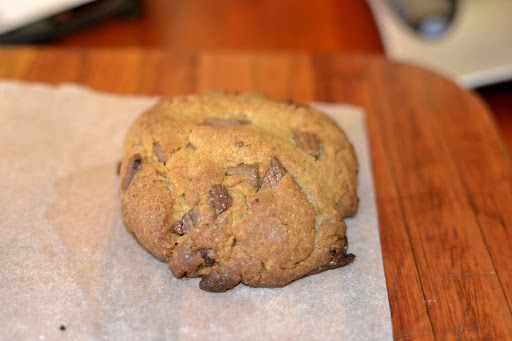 I read an article on the New York Times relatively recently all about the quest for the perfect chocolate chip cookie. The article basically said that if you want the best tasting cookie you need to refrigerate the dough for 3 days. This gives the flour time to absorb the eggs and butter and results in a more caramel, sophisticated taste. Feel free to try this out. I am not the kind of person who can wait 3 days for a cookie. I’m also not the kind of person who thinks ahead by 3 days. Apparently the flavour improves after one day so perhaps you can wait that long. I can’t and these taste awesome when made and baked in a frenzy of depressed book madness. Mix the melted, cooled butter and the sugars together before adding in the eggs and vanilla. Mix in the flour until all the ingredients are combined. Lastly, mix in the chocolate chips. (I find this easiest to do by hand because the amount of chips is fairly overwhelming.) Form the dough into cookie shape mounds and press down to flatten. Bake at 170C for about 15minutes – depending on the size of your cookie and the oven itself. * The original recipe calls for significantly more chocolate chips that this but I find that more is not necessarily better in the quest for chocolate chip godliness. In this case, this amount of chocolate is more than sufficient to get a well rounded, well studded cookie. The book is called One Day and I have now finished it. It gets better for a while so is slightly redeemable but I do think you need a supply of these cookies to get you through.